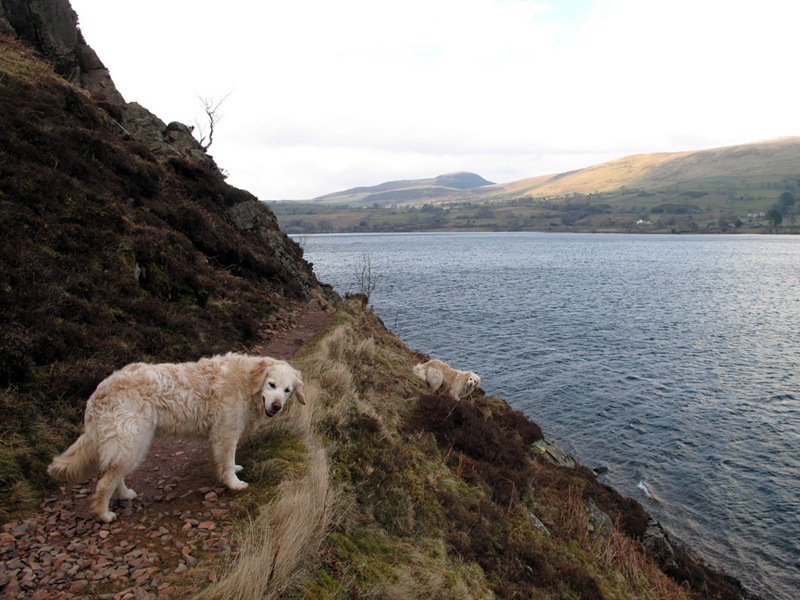 " Anglers Crag and Fangs Brow "
Date & start time: Monday / Wednesday, 18/20th March 2013. 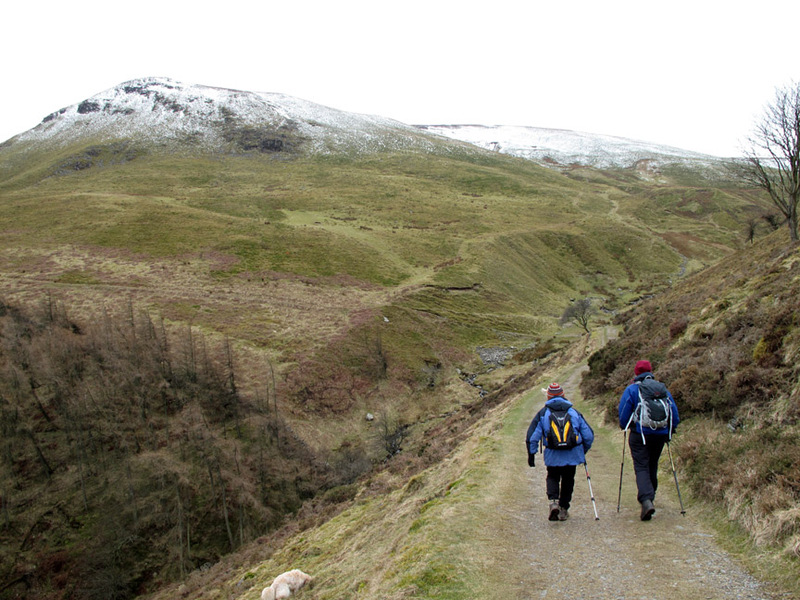 Walk one : 2.75 mls, 550 ft of ascent, 2 hours. 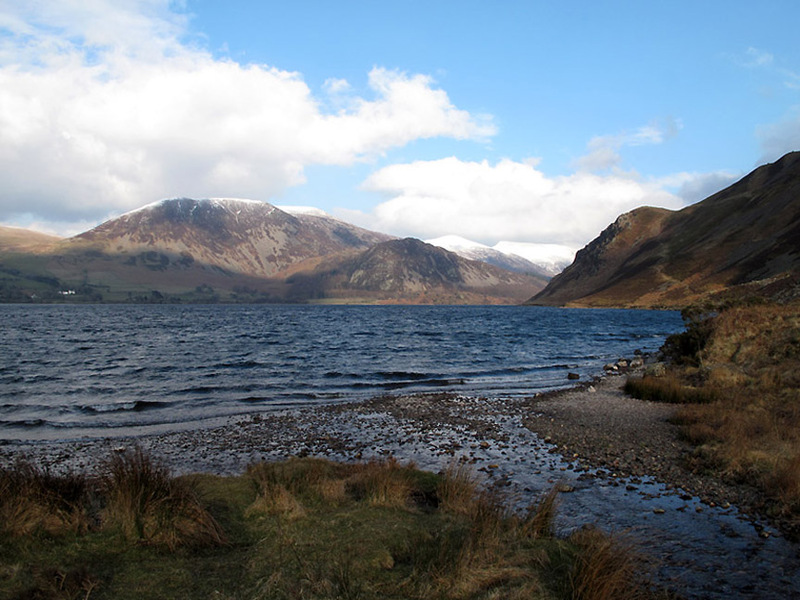 Places visited : Ennerdale Water and Anglers Crag. Walk Two : 4.25 mls. 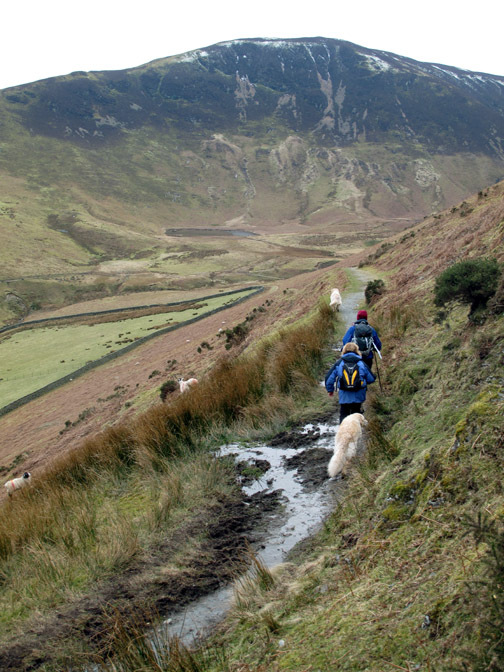 650 ft of ascent, 900ft of descent, 2 hours 20 mins. 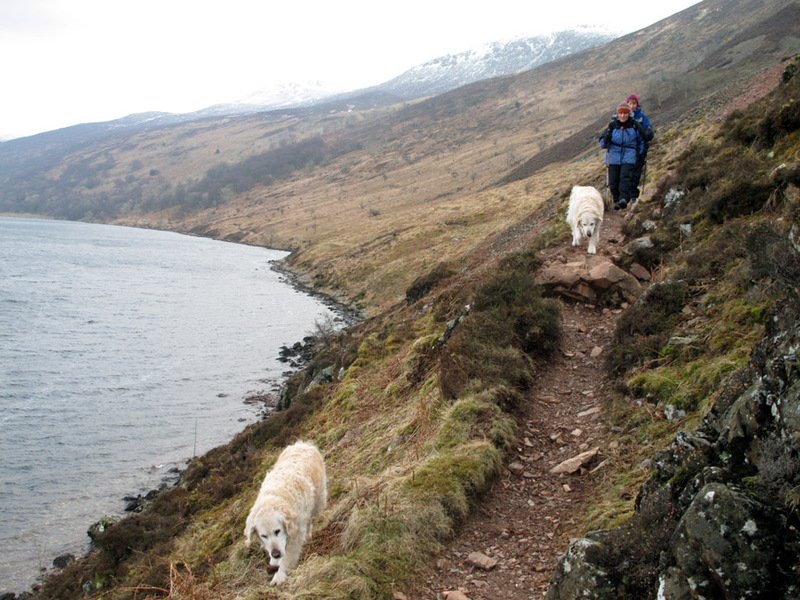 Walked with : Sherran and Bill, Ann and the dogs, Harry and Bethan. Weather : Dry but a cold breeze, warmer in any sunshine that was on offer. the sun comes out and all is right with the world ... time for a walk. Today Sherran and Bill are over with us.
. . . so we started with a long and lazy lunch at home ! 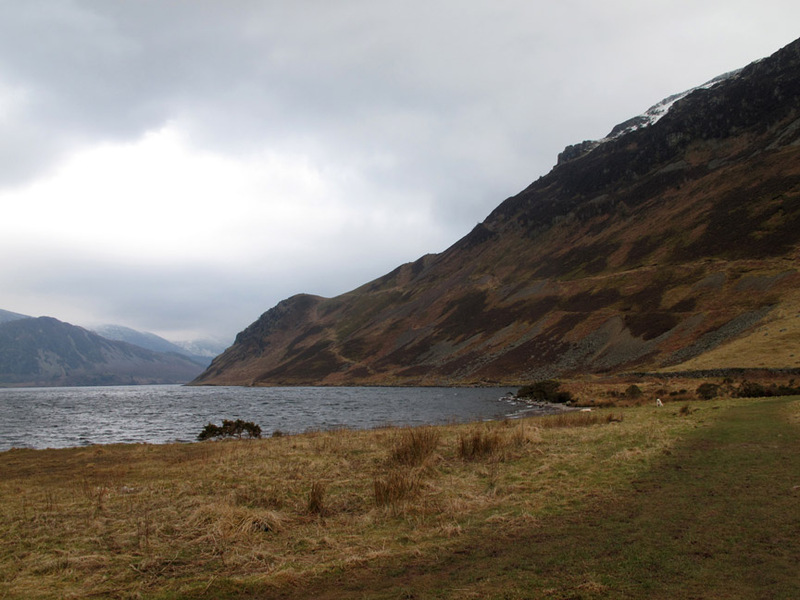 Afterwards we drove the short distance over to Ennerdale Lake. 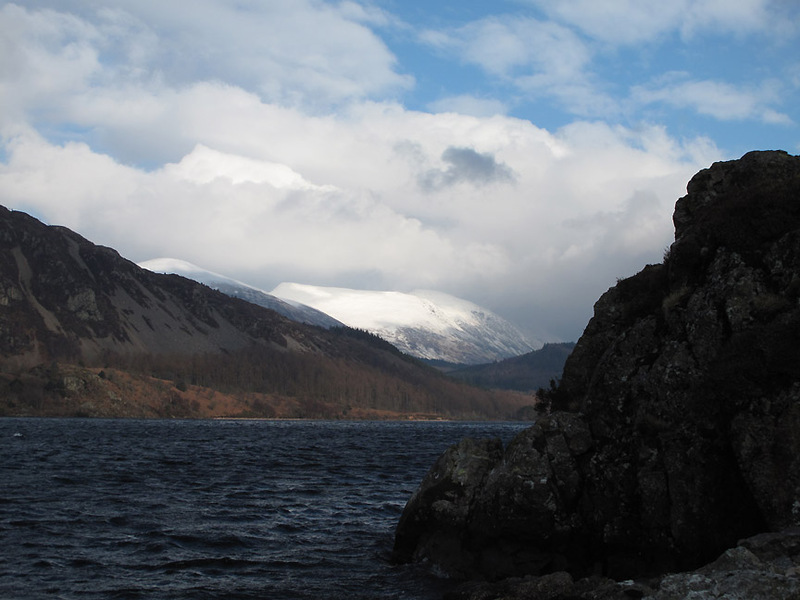 The plan for this afternoon was a short-ish walk over to Angler's Crag, seen here from the foot of the lake. 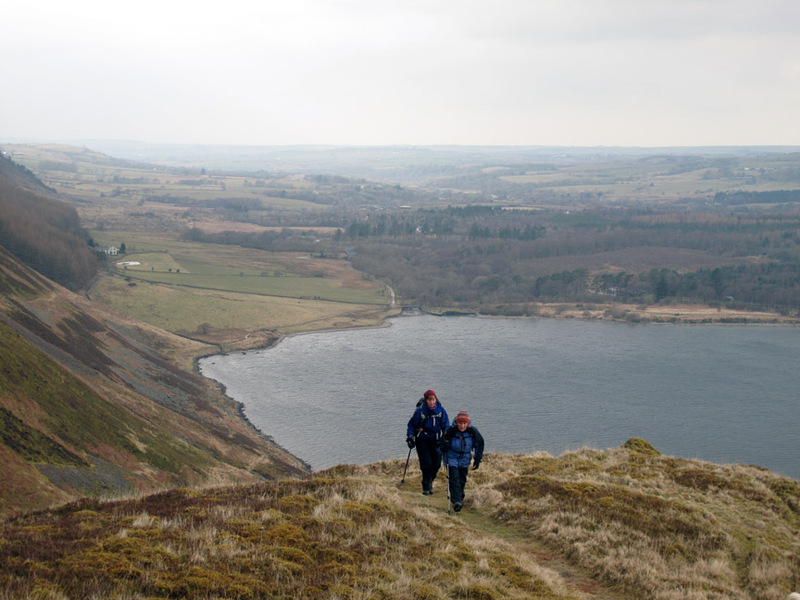 It was not going to be all flat walking . . .
. . . we'll be taking that ascending path up to the lower summit of the rocky crag overlooking the lake. 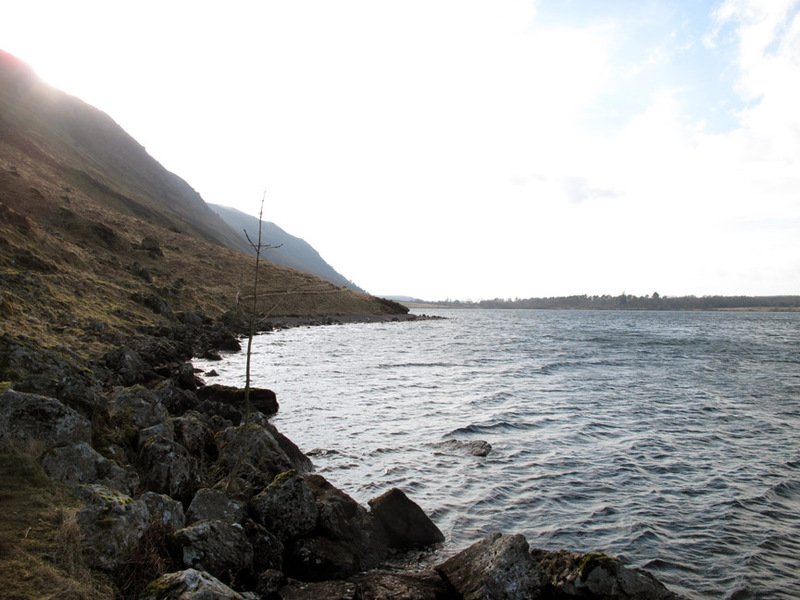 but here in the lee of the crag it was warm enough to take a picture of Great Borne opposite. 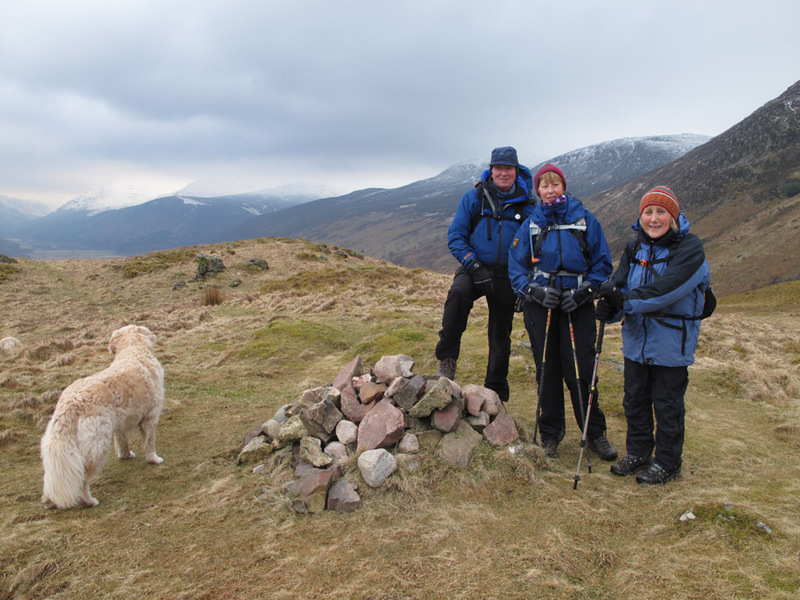 Hats, gloves and zipped up jackets as Sherran and Ann climb onto the windy summit. 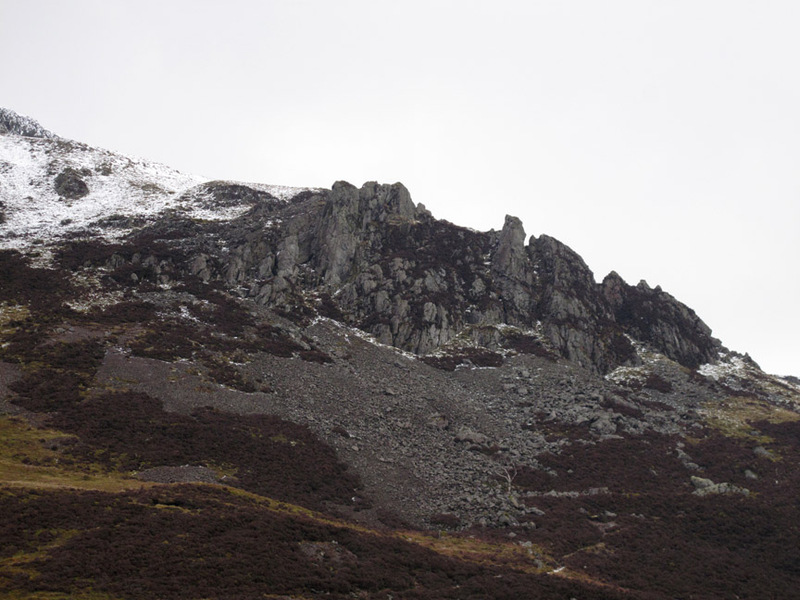 Looking up at the Pinnacles, the rocky outcrop on the side of Crag Fell. 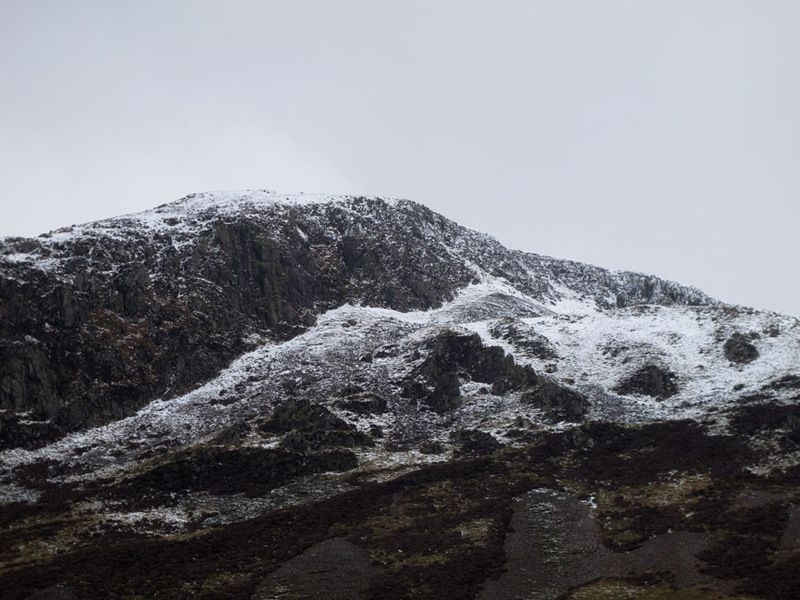 The summit of Crag Fell itself has a heavy dusting of snow. Say cheese . . . okay . . . please yourself Harry ! 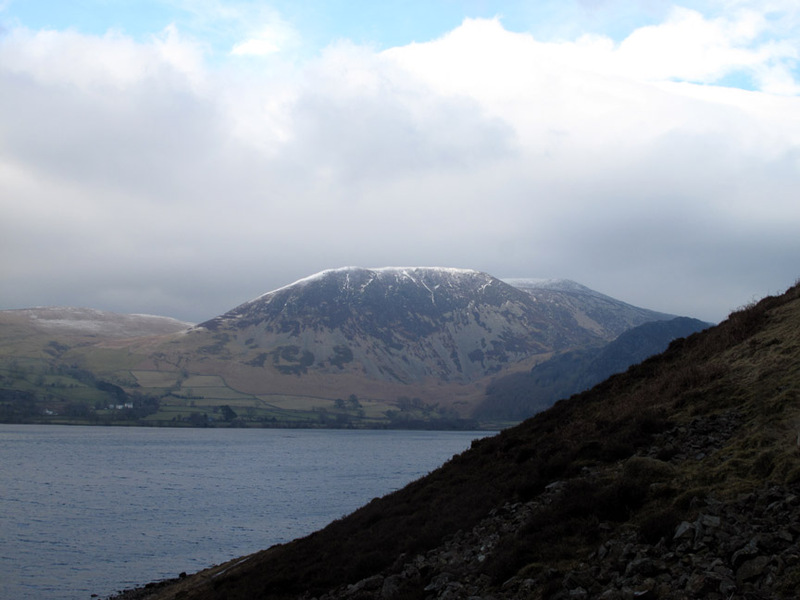 round to snow covered Red Pike, High Stile, Pillar Fell in cloud, Steeple in cloud and round to Iron Crag on the right. 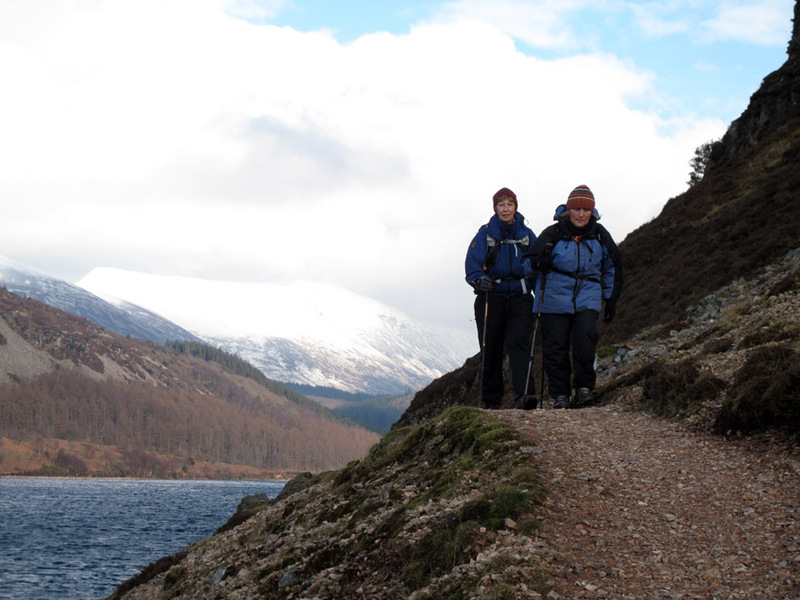 Up one side of the crag and down the other allows us to make the outing into a circular walk rather than a linear one. We return underneath Angler's Crag, passing an area known (for some reason) as Robin Hood's Chair. That promise of blue sky and sunshine might just come true. 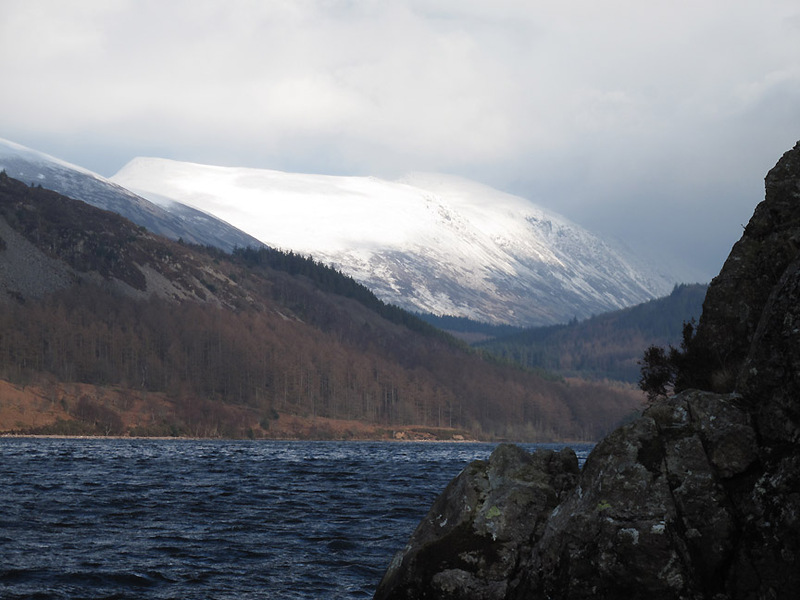 which allows the sun to shine on Red Pike, making the white snow glisten brightly. but further back there was a little scramble where hands touched rock just to steady yourself. Back towards the sunshine and the foot of the lake. The diminutive Ben Gill works its way across the fields to disgorge itself quietly into the lake. 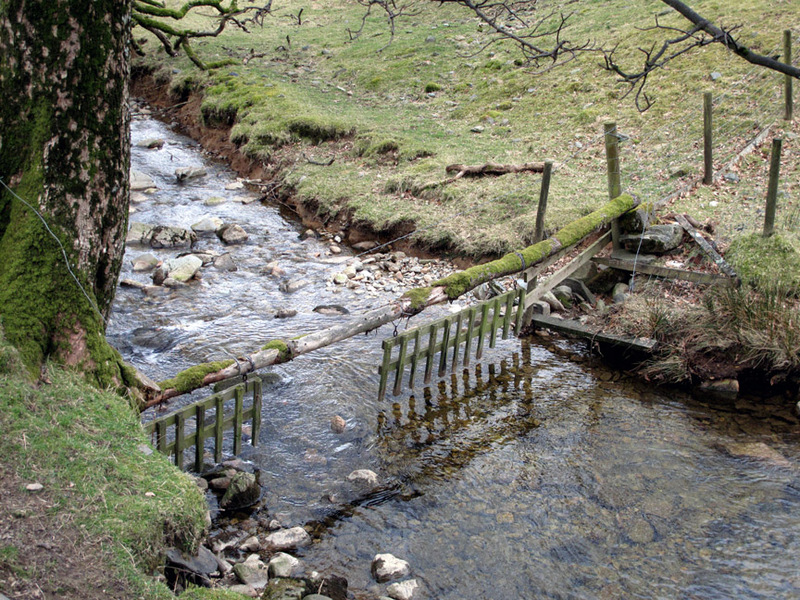 This is the small stream that rises on the side of the valley between Crag Fell and Grike. The walk nearly over . 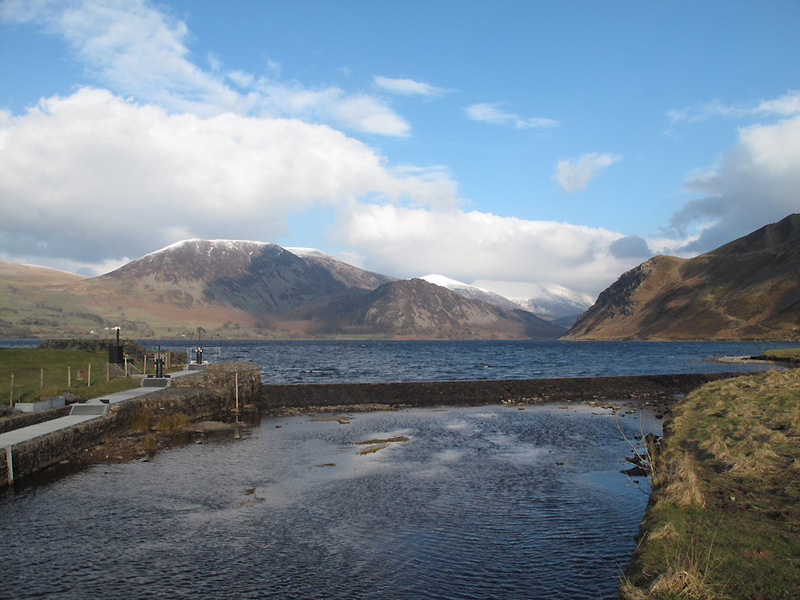 . .
we look back at the weir and to a much sunnier Ennerdale Valley than when we arrived. Two days later we have chance to meet up again for an afternoon walk, this time a little closer to home. 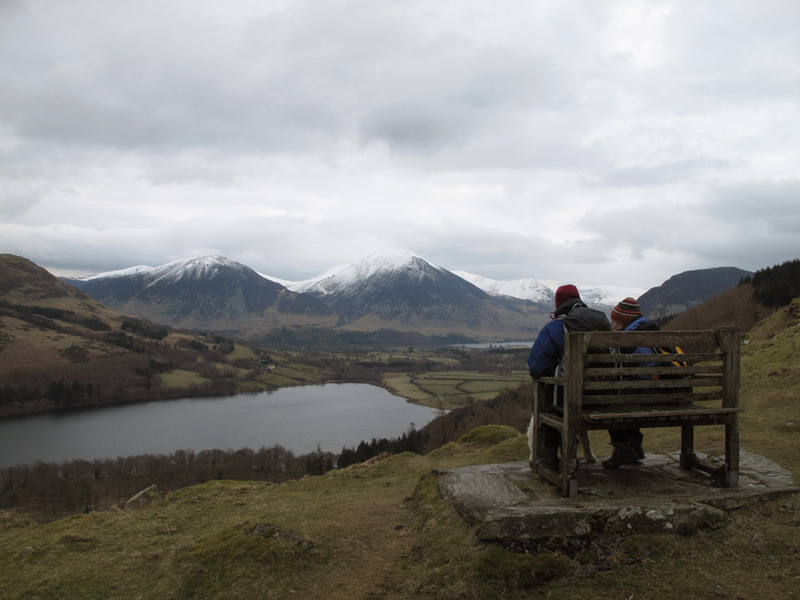 A linear walk this one as Bill and Sherran have not visited the Coffin Road and the chair above Loweswater. 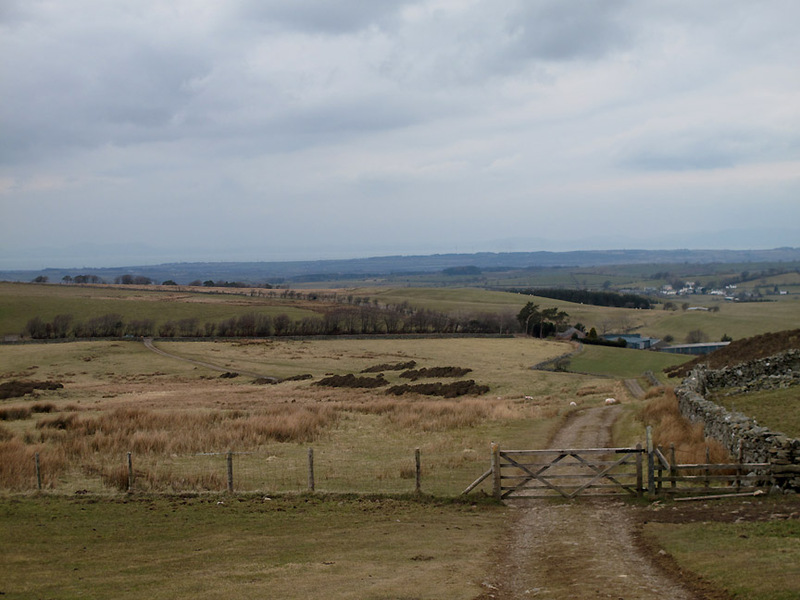 We started on the road just up from the pine trees close to Fangs Brow Farm. A cold day again but a more gentle breeze keeps the comfort levels up. March is lambing time but this is our first pictures of the new season lambs. 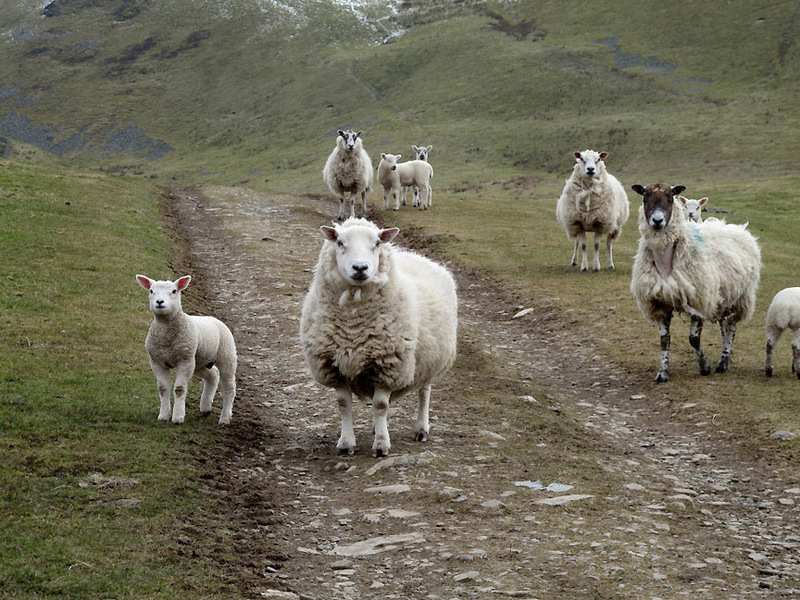 They are already quite big up here on the Lamplugh fell side. Two youngsters in the adjacent field. 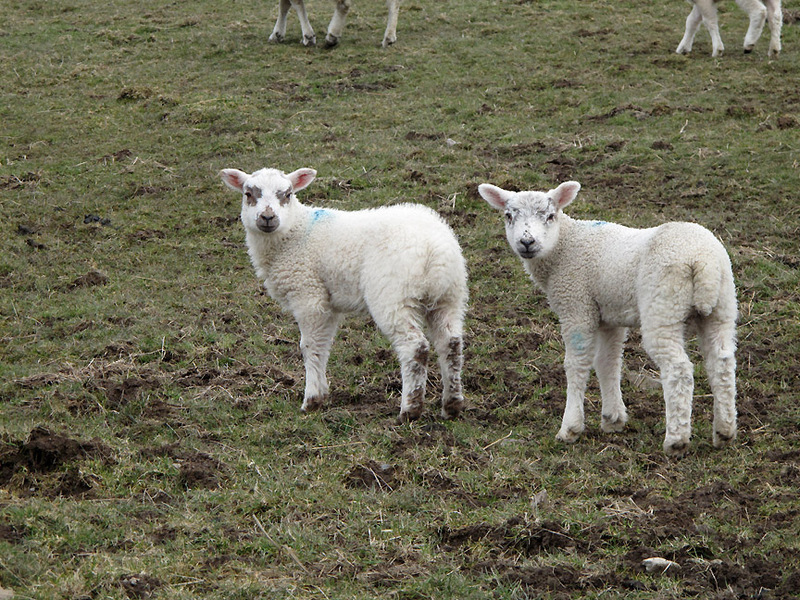 Since we took these photos we've started seeing more new born lambs in the fields closer to home! 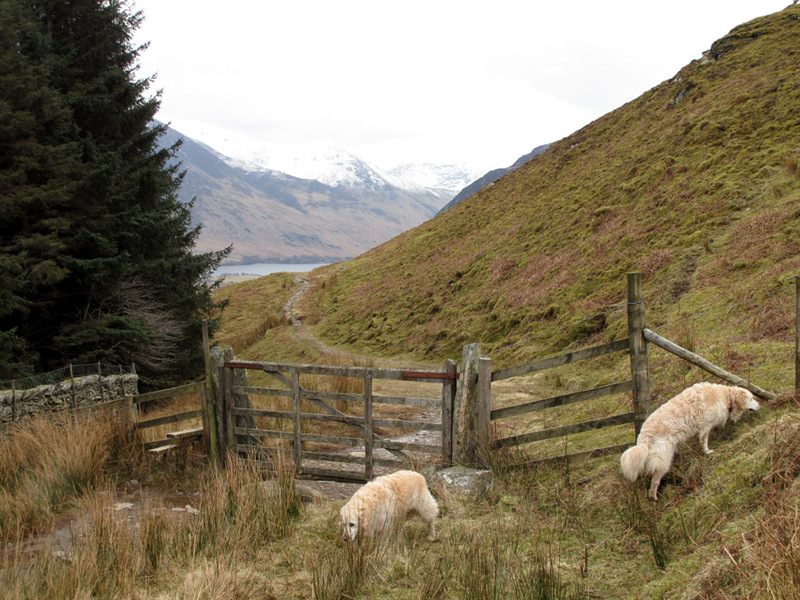 The first gate on the walk up towards Burnbank and the Chair. Disaster narrow averted as Sherran raises her head in time to see the second gate ! as the route transverses underneath the end of Burnbank. so it is Sherran and Ann's turn to relax this time. 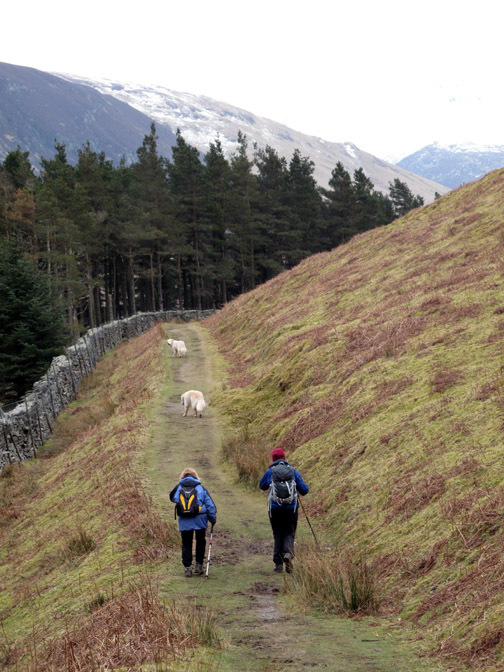 Onward and round the corner, following the track under the high ground of Carling Knott. In the photo is the upper reach of Holme Beck before it disappears into the forest below and cascades over the waterfalls below. The dogs wait for the gate to be opened this time . 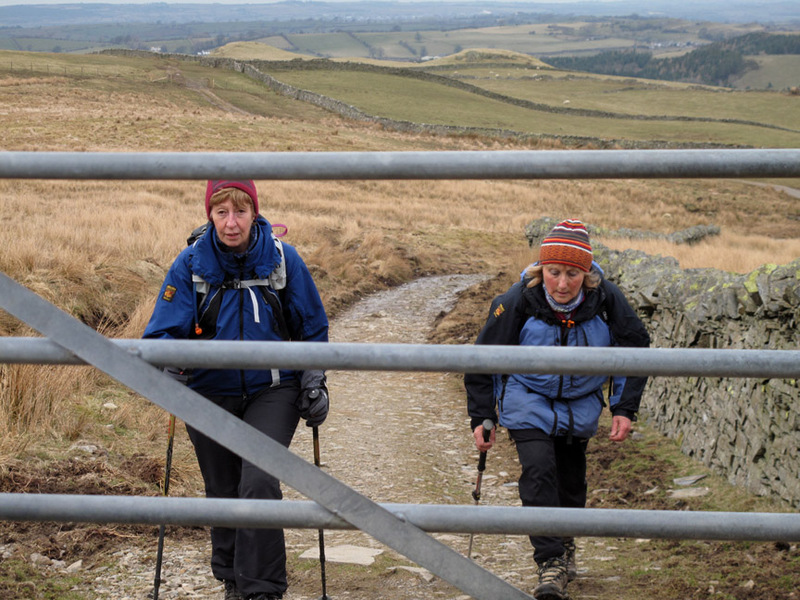 . . rather than climb the stile. Ahead is the snowy outline of the Red Pike / High Stile ridge . . . rather lost in the flat afternoon light (Wed 20th March). and tomorrow (22nd) they'll probably be obliterated in a white-out . . . if the forecast is anything to go by ! 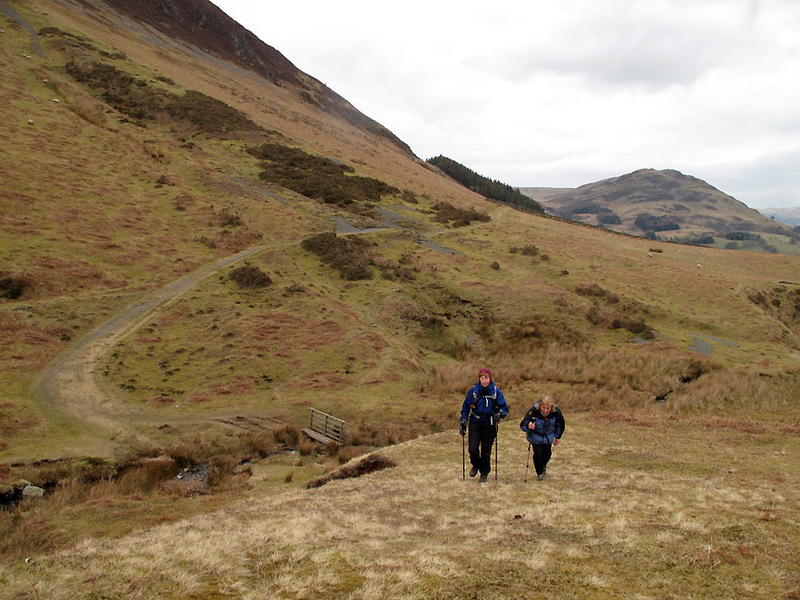 The track continues on around another bend . . .
. . . and now the view to High Nook Tarn is unfurled before us. To our left as we walk along . 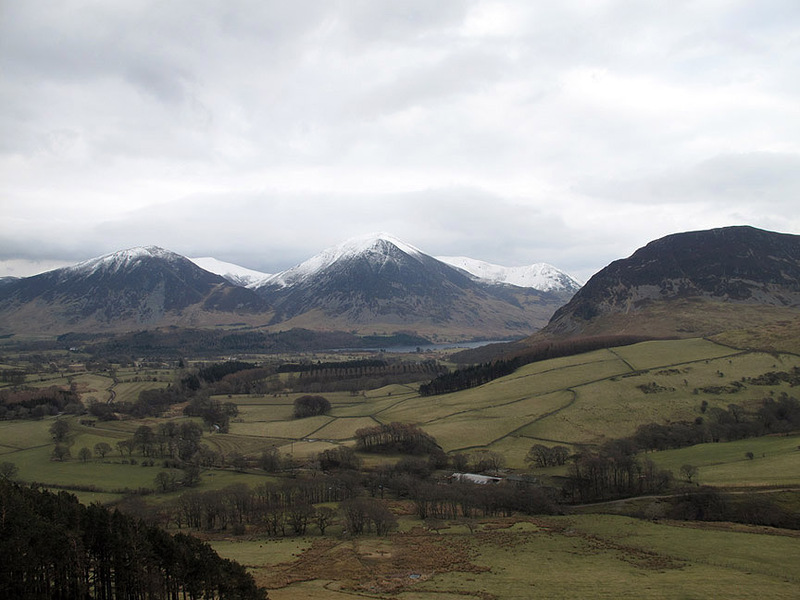 . . is the wide view across to Whiteside, Grasmoor and Mellbreak. High Nook Farm nestles in the trees below. 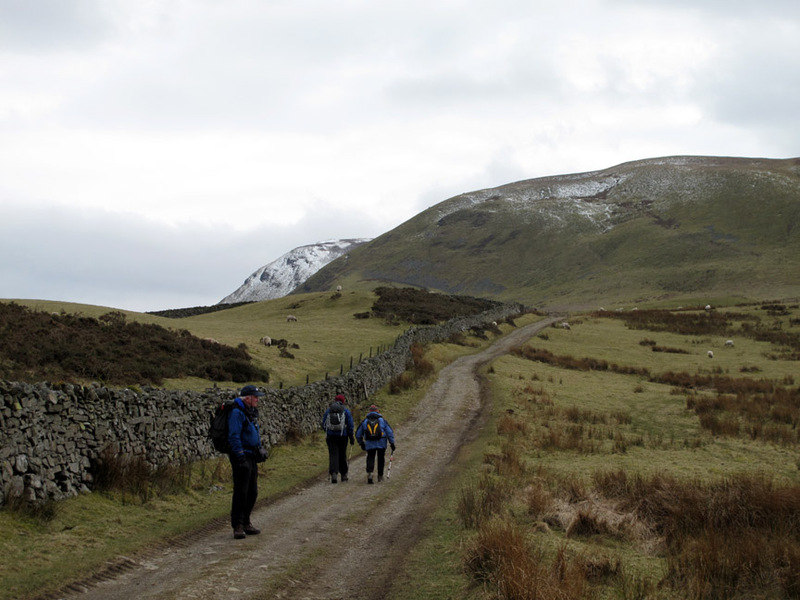 heading up this time for the tarn rather than the direct route back down into the main valley. Still life . . . if only for a moment . 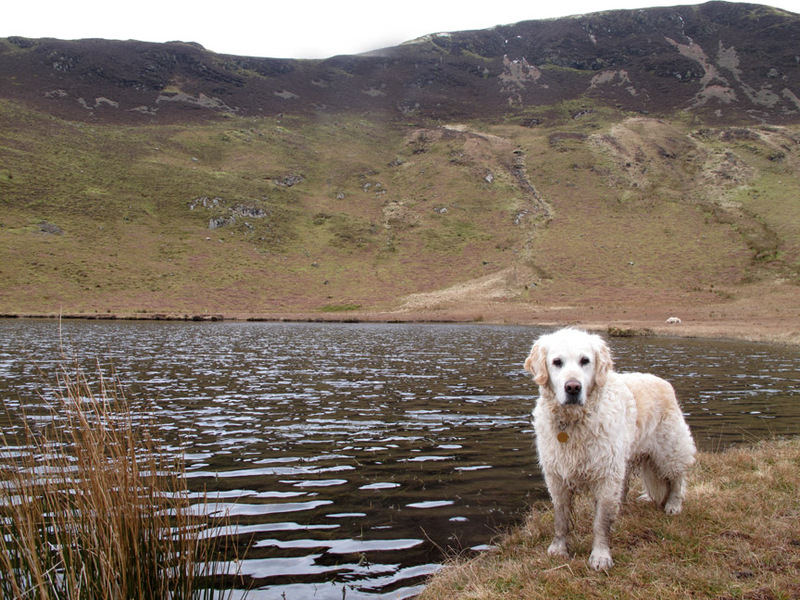 . . Harry alongside High Nook Tarn. 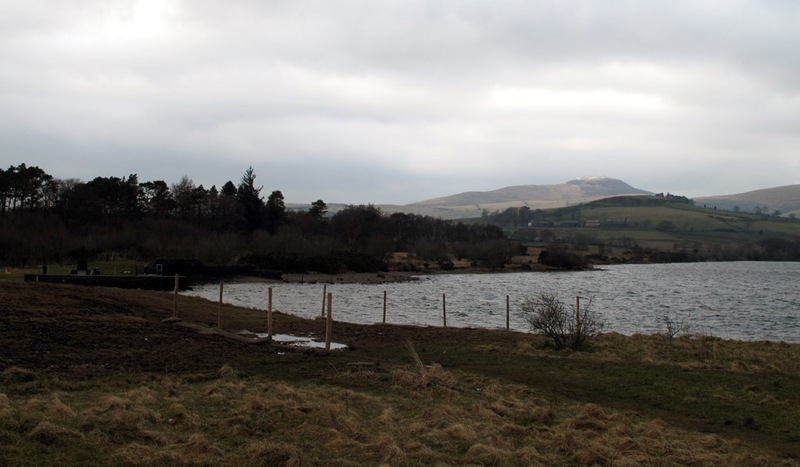 A wider view of the tarn with Black Crag behind. 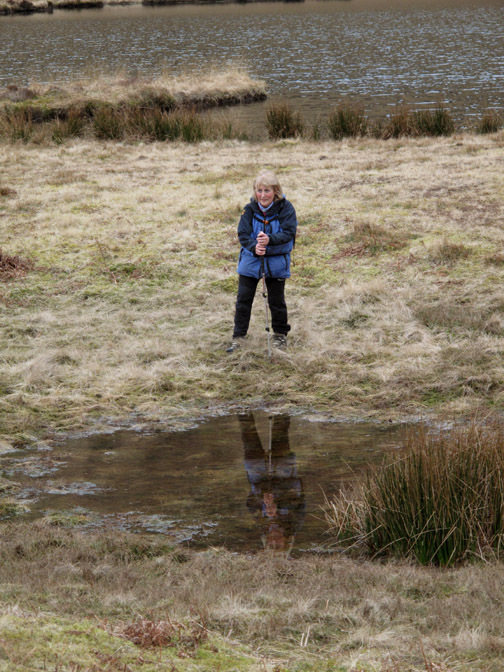 The tarn fills the glacial depression under the crag and surprisingly is not fed by the main stream within the valley. 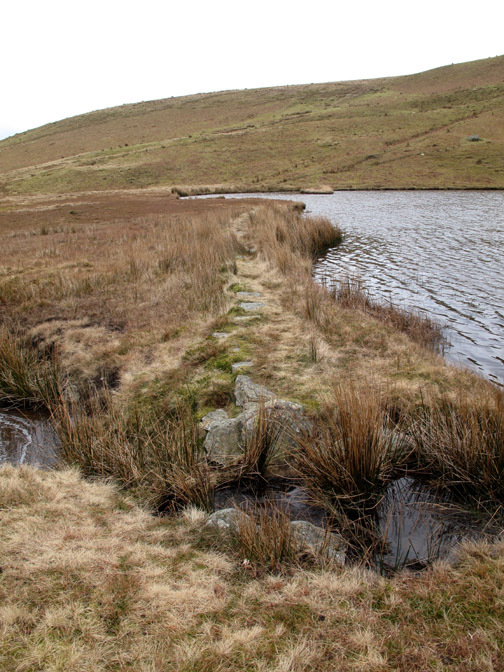 Also we noted that there is a dwarf wall of stones actually forming the edge of the tarn . . . turning a once boggy area into an attractive lake. Barely one stone high but it does add a specific edge to the tarn. An adjacent pool in a grassy hollow allows Ann's reflection to form. 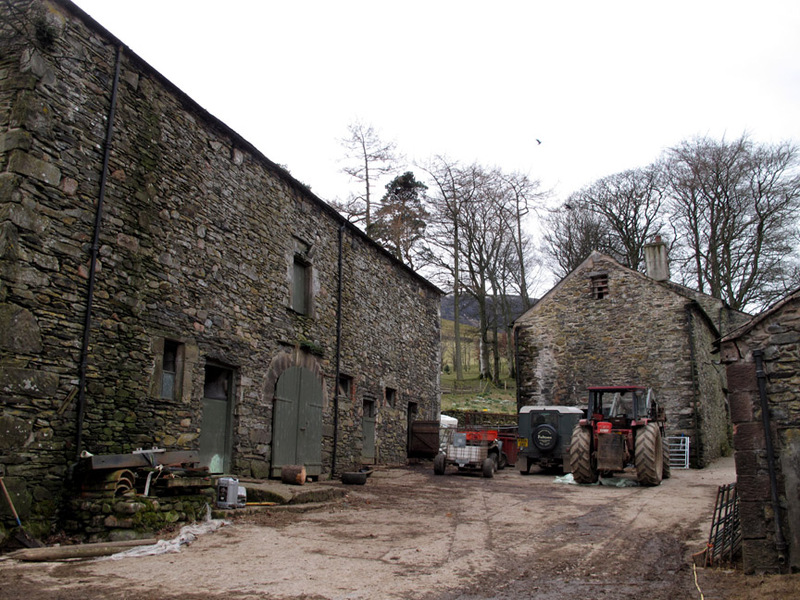 Down through the classic hill farm courtyard. 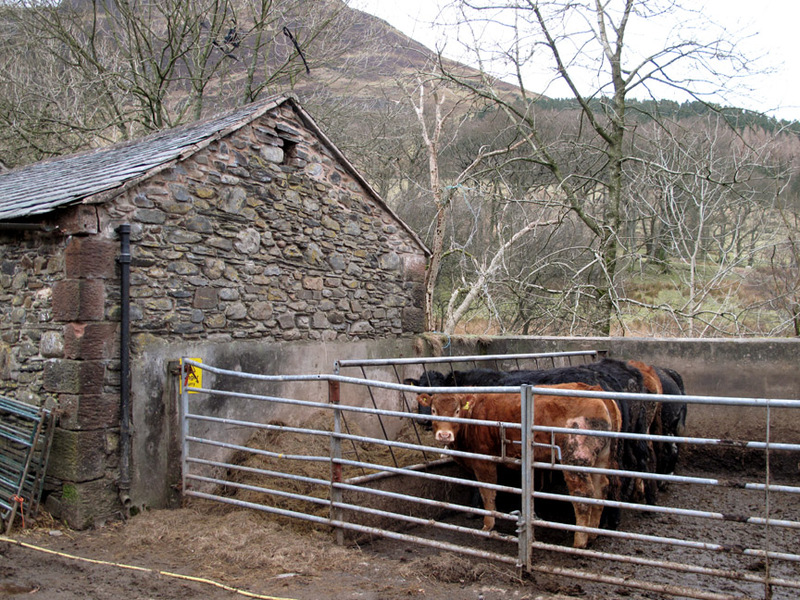 The fields are too soft at this time of year to allow the cattle out, so they are fed in the barn or out here in the outdoor stalls. 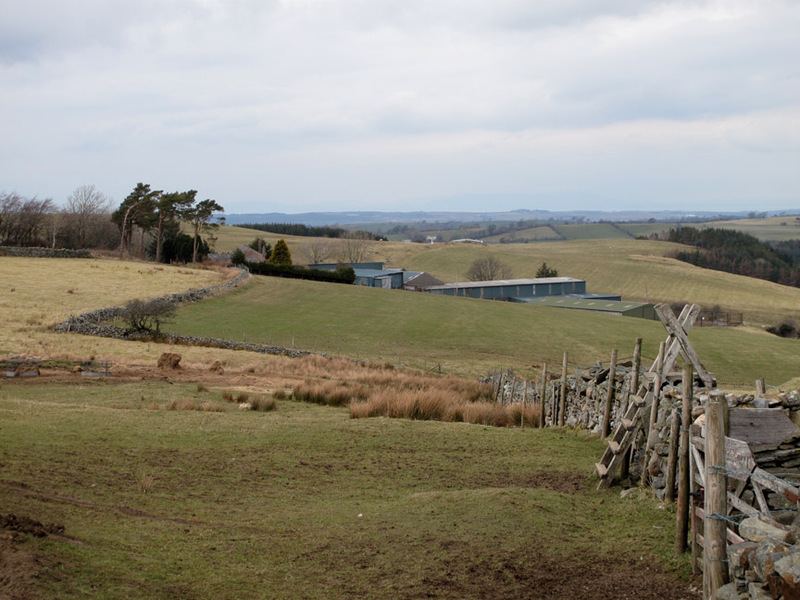 High Nook Barn and Farmhouse . . . still very much a working farm. 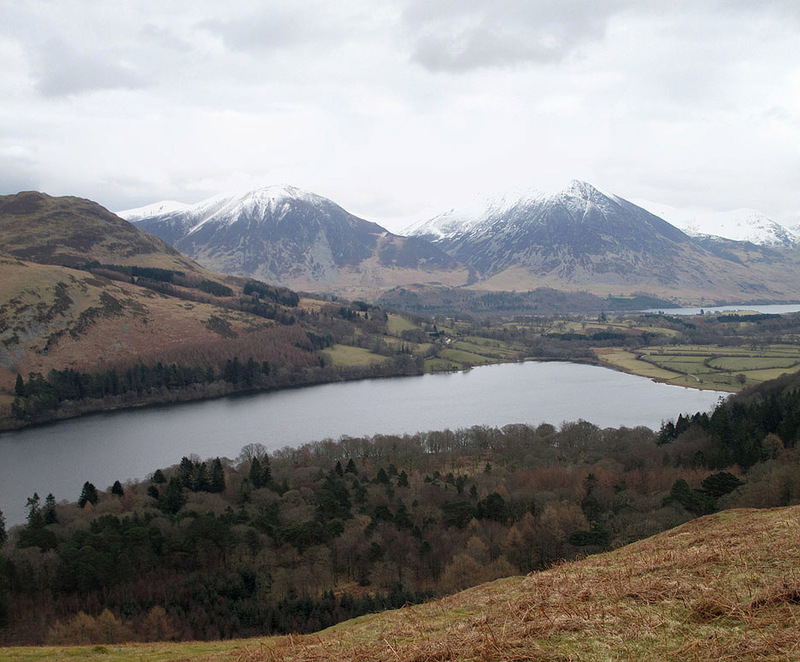 and together they form a wider river that makes its way down to join the Loweswater outflow. Bill Gaughan, Sherran Margaret (Maggie) Gaughan and Ann . 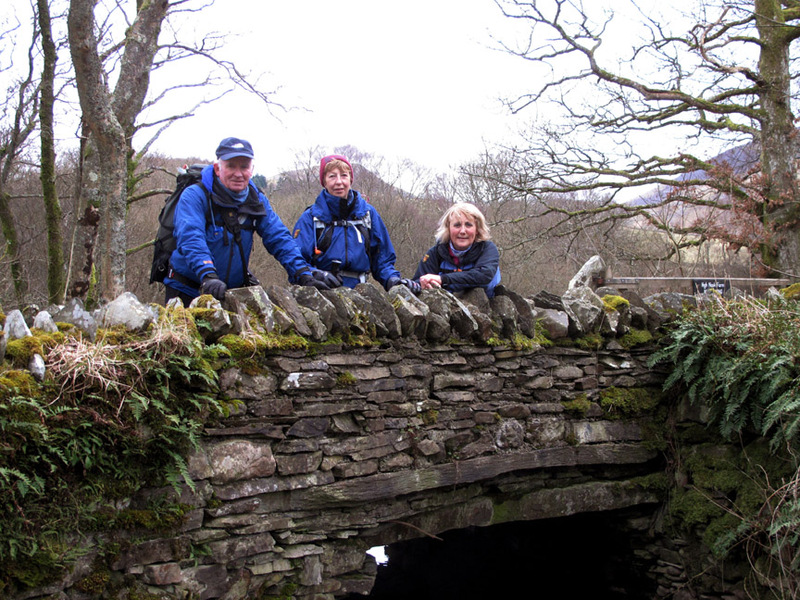 . . on Maggie's Bridge towards the end of the walk. Technical note: Pictures taken with either Ann's Canon Sureshot SX220, my Canon G10 digital cameras. This site best viewed with . . . a car at the other end to go and fetch the first one !